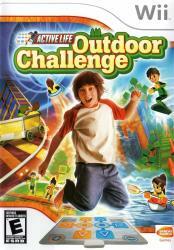 Jump into the action with ACTIVE LIFE: Outdoor Challenge! Use the special mat with the Wii Remote in more than a dozen fun, fast-paced activities. Play alone or with a friend in both competitive and cooperative challenges. Move your whole body in a variety of heart-pumping activities like kayaking, in-line skating, log jumping, mole stomper and mine cartracing. Train your body!